Erika Tran has been an asset to InterAmeircan since 2003. 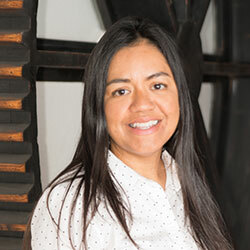 She has served as office manager of the San Diego office and is now heading up IAC's Sustainable green coffee sourcing. Her passion for sustainability and organic coffee has lead her on many trips to origin, creating relationships with producers from all over the world. She has led daily cuppings for more than 5 years; she is a certified Q-Grader and star cupper. She has had the opportunity to participate as a judge for Cup of Excellence, a cupping judge for Rainforest Alliance, and volunteered for Coffee Quality Institute (CQI). Erika is bilingual, fluent in English and Spanish. Erika is an excellent teacher. She loves to teach cupping and every aspect of the business. Her motto is "Wisdom begins in wonder." Erika has a Bachelor of Arts degree in International Business from San Diego State University.